The traditional parade of anti-Putin ultranationalists in Moscow was in fact completely overshadowed this year by the success of a patriotic demonstration organized by the majority parties as well as the « patriotic opposition » (KPRF at the front) in support of the Russian President and his policy in Ukraine. Brandishing slogans « We are united! » or « We have trust in Putin”, nearly 100,000 people have crossed, according to police, the main artery of the Russian capital, flying Russian flags and ribbons of St. George, « a rally symbol of pro-Russian separatists in the eastern Ukraine” says AFP, which fails to mention that it is mainly the anti-fascist symbol of the victory of the Great Patriotic War of 1941-1945. A Fascism occupying the streets of Kiev and Lviv, but sometimes those of Moscow. Organized on the occasion of the celebration of National Unity holiday in Russia commemorating the expulsion of Polish occupation forces from the Kremlin in 1612, November 4 leads each year to marches and demonstrations in major cities of the country. « Today is the day of my hero, the savior of my people, it is the celebration of Putin, who united the Russian peoples, » enthuses Maroussia Nikolaevna, a « Novorussian », 59 years old, who came from the bastion of Donestk with friends of Crimea, peninsula having returned to Russia in March. « I’m here because I support Putin’s policies. And I’m not alone, I’ve never seen so many people! », adds Vladimir, 70 years. At the platform, representatives of the main political forces in Russia, including the ruling party United Russia, the Communists of the KPRF or the ultra-nationalist LDPR, show their support for the strong man of the Kremlin and the pro-Russian rebels fighting against the Kiev junta troops in the former « eastern Ukraine, » becoming again the Novorossiya for more than six months. Support is clear, clean, sharp, challenge to Westerners: « We are united with our brothers in Novorossiya », launched on stage Sergei Mironov, leader of the pro-Kremlin Fair Russia party. The magnitude of this demonstration of patriots eclipsed the traditional annual parade of ultra-nationalists, largely neo-fascists or neo-Nazis, mostly opposed to Vladimir Putin, which worked hard to gather this year. The « Russian March », « which gathers every November 4 no less than fifty ultra-nationalist and far-right factions, » said coyly AFP, and has attracted only 2,000 people according to police, far from 10,000 to 20,000 people expected by the organizers. Xenophobic and racist (the icon of NATO media, the swindler Navalny is one of the xenophobic leaders), usually united by their rejection of the presence in Russia of immigrants from the former Soviet republics, these factions were divided this year on the Ukrainian question, supporters of Ukrainian Nationalists marching alongside the pro-Russian separatist supporters. Betrayal and confusion mingled in the gutters of Russian politics! But the failure to gather was also that of the monarchist (of which the black-yellow-white flags dominated the demonstration) and nationalist factions which support Novorossiya outside the pro-Putin organizations. Another demonstration of nationalists, this time in support of the Russian-speaking population of Ukraine, drew much less crowd than the « Russian March ». The charismatic former separatist leader Igor Strelkov, who called this gathering of his wishes, ultimately did not participate in it. Strelkov is an officer of high value, a Russian hero, without whom Novorossiya would not have stood fast in the first battle, who claims to support Putin but with the wrong crowd, including anti-Putin bloggers around the western spook Limonov. Whose meager troops had joined the monarchist parade. Limonov, nor national (sic) nor Bolshevik (resic) was a leading figure of the anti-Putin front « The Other Russia » with the liberals Kasparov and Kasyanov and the Trotskyites of Udaltov. A gathering sponsored by the US and intended to organize a color revolution in Russia. Suddenly in March with the issue of Crimea, Limonovist traitors have discovered a patriotic fibre and support the rebellion of Donbass. Appearing under the name of « Russian Spring » (Western slogan) or « Other Russia » they intend unsuccessfully to destabilize Putin on the issue of Patriotism. The Russian Prosecutor General’s Office has also opened two weeks ago an inquiry , followed by searchs on embezzlement by Limonovists of « fundraising for the Donbass » organized by them (including in France where they have relays ). Note that the presidential and parliamentary elections of November 2, in the People’s Republics of Donetsk (DNR) and Lugansk (LNR) showed in a similar movement the candidates near the Kremlin patriotic line, as the new presidents Aleksandr Zakharchenko or Igor Plotnitski, win an overwhelming majority as indisputable leaders of the republics of Novorossiya. And the factions collapse. The elections have particularly clarified the political situation in DNR and eliminated from the political game various factions and militia leaders, media-noisy but having not even been able to present themselves in the legal requirements set by the DNR CEC. - The All-Russian patriotism, linked to a state vision of the Russian World, imperial, open to all compositions of the Russian Empire and now the Russian Federation, including Caucasians and integrated Muslims. This view was also that of « Soviet patriotism » imposed by Stalin, with in the background the « Russian National Bolshevism » (which was in the early twentieth century, nearly two decades before the German National Bolshevism of Niekisch, the ultra-left trend of the Bolshevik Party of Lenin). 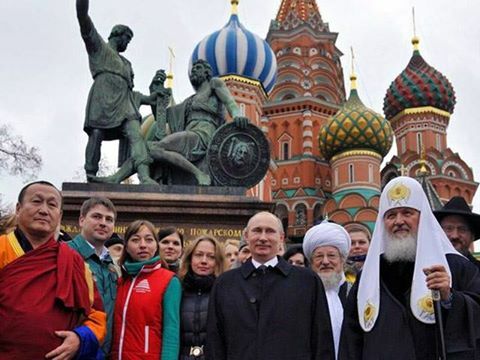 - Russian ultra-nationalism based on a reductive ethnic vision of a Russian Nation purged of its non-Slavic and non orthodox elements, including Caucasians (called « black asses »), reductive view that would deprive Russia of its very power. Analysts and critics of the Kremlin accuse Vladimir Putin to promote, since the beginning of the crisis in Ukraine, nationalist sentiments to justify the worst confrontation facing Russia to Westerners since the end of the Cold War. « The government is doing very well now alone to mobilize the nationalist electorate, » said Fyodor Krasheninnikov, chairman of the Institute of Development Studies and modernization (pro western). Photo: pro-Putin massive demonstration in Moscow this November 4, 2014. This entry was posted in # ACTU / BREAKING NEWS, * English, * LM/ Focus pour PCN-SPO, * LM/ Leaders & analyzes 1983-2013. Bookmark the permalink.